The path we were on was leading us to a pond where we would likely see some good wading birds—essentially anything in the heron family. It’s November and we were at the Key West Tropical Forest and Botanical Gardens for our first day birding in south Florida. I looked up at the motley crew of trees—palm intermixed with pigeon plum—looking for movement. It was raining off and on today and so it didn’t appear to be very birdy. I turned to the nearby pond, hoping for better luck. “Look!” I said as I pointed to the long black neck sticking out of the water. “I know,” I said trying to impress my husband. 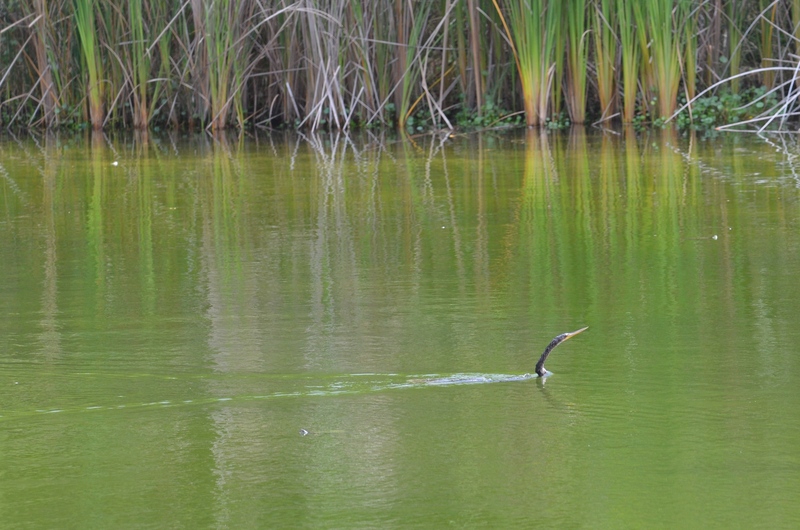 “They call that the snake bird because it looks like a snake in the water.” I had read this somewhere recently and took note of it so I could later throw it to my husband matter-of-factly as an impressive maneuver. We started walking again and I was feeling rather proud of myself when I saw something else. I clutched on to Steve’s arm to stop him so not to startle what I saw. “Stop.” I said forcefully but with just enough airiness it sounded like a loud whisper. I could see through a break in the trees. The pathway took a sharp turn ahead of us where it wrapped around and I could see something big and white as I glimpsed through the trees by my side. I thought perhaps it could be the Great White Heron I was hoping to see on this trip since the only place to find this bird is in the Florida Keys and Everglades National Park. The Great White Heron is related to the Great Blue Heron and was originally thought to be a separate species, but in the last couple decades has been considered to be the same as the Great Blue Heron. One might confuse it with the Great Egret but the Great White Heron has whitish legs while the Great Egret has black legs. Plus the Great White Heron is much larger than it’s cousin the Great Egret. We began walking again but at a much slower pace, and as we turned on the path, there it was, standing tall and regal. It was all white and it’s long neck was sticking straight up as it stood motionless next to a park bench in an open area where there were sets of musical chimes and vibraphones. It’s pale beak the color of straw pointed toward the pond as if like a weather vane or sun dial. It stood frozen. Steve was on it with his binoculars and confirmed, “Yeah, it’s a statue,” and we chuckled about how we were such idiots. Made sense. This area looks like a place to sit and relax, what with all the garden art and interactive areas near the pond and the park bench. This happens all the time in birding. Not just with us but with pretty much any birder, especially when looking for something specific. You spot an unusual yellow color on a branch in a sea of green leaves and you’re convinced it’s what you’ve been looking for, yet it turns out to be, well, “leaf bird.” But it’s not always “leaf bird.” There’s “stick bird,” and “rock bird” to be found as well. (Admittedly, I also have quite the library of photos of all those “birds.”) You feel a little like an idiot, but it remains the knowing chuckle in the field and other birders generally are forgiving of it because we’ve all done it. As we walked toward the park bench musical vibraphone area we scanned the ponds on both sides for anything interesting. 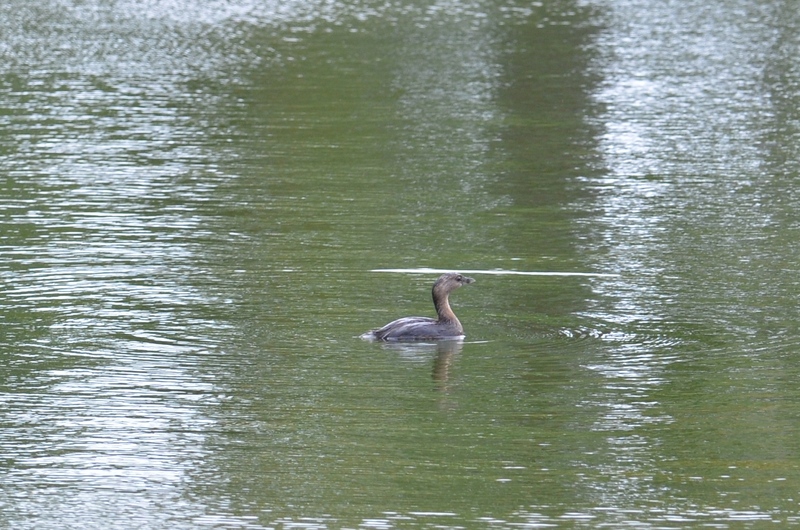 I spotted a Pied-billed Grebe floating around and just as I began to shoot a photo he dove underwater. “He’ll pop back up,” Steve reassures me. I keep my eyes peeled and sure enough he reappeared about 10 feet away from where he dove. I snapped more photos than what I needed and then I made my way toward the vibraphones. 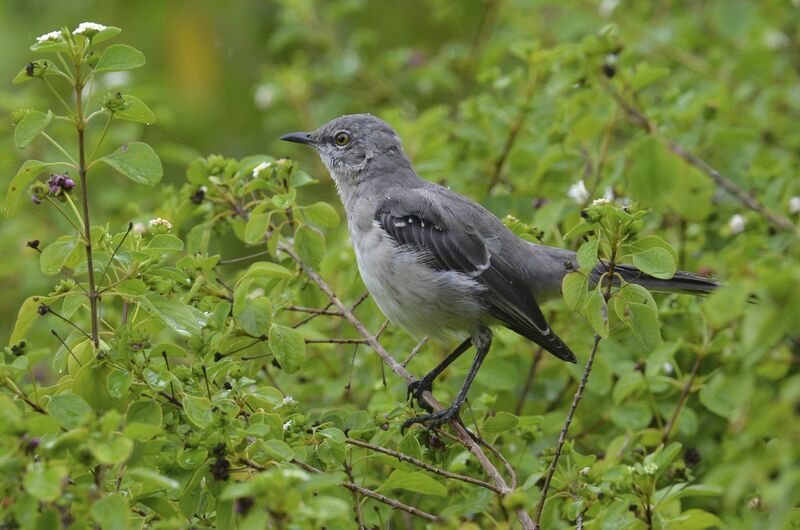 As I was giving the vibraphones my best Lionel Hampton effort (it’s been a longtime dream of mine to play the vibes) a Northern Mockingbird with little rain drops on its back popped out, seemingly in response to my musical efforts. I abandoned my musical concert in time to snap some photos and the Mockingbird showed great courage as I took steps closer to him for a better shot. Perhaps I won him over with my exceptional mastery of the vibraphones. Nearby we heard a slow chit chit chit coming from a low tree. 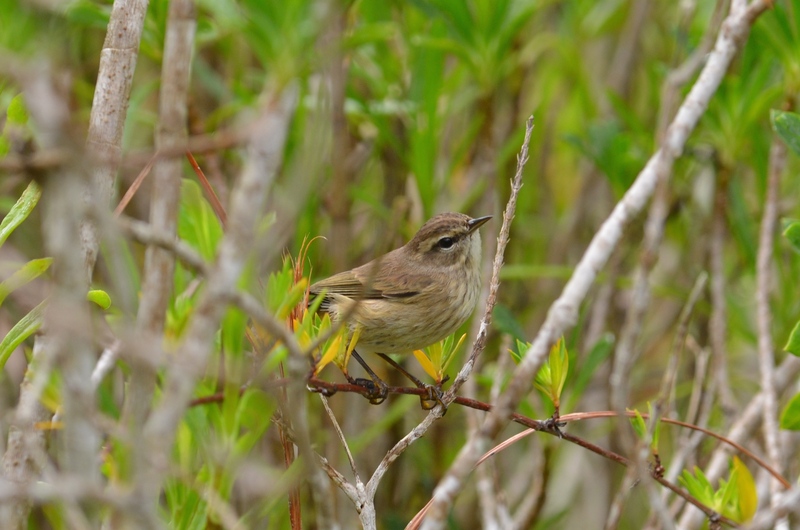 A juvenile Palm Warbler was flitting around, jumping from branch to branch like a little undecided bird on caffeine, pumping his tail up and down, yet not worried about us humans only three feet away from him. I snapped the camera as quick as I could in hopes of getting a picture of the little brownish and yellow warbler that wouldn’t stay still. I don’t know why, but I turned around and looked at the park bench. And then we laughed like the idiots we were. The Great White Heron statue fooled us and it was gone. Thanks for visiting, Bernard. Sometimes I think it’s a conspiracy by the birds. I have to applaud that Great White Egret for pretending to be a statue. It worked! Very nice! Once again I have to applaud you for not taking yourself as seriously as so many birders and photographers do. And the mockingbird! Fabulous – love that photo! Wish I could angle down across the country and bird Florida with you for a few days – rich pickings! Enjoy. Thank you for your note, Bluebrightly! Yes, we will have to connect up and go birding sometime. I can’t believe that Mockingbird was so used to humans. I was only five feet away. You know they can be pretty fierce – I saw one attack a cat repeatedly on a sidewalk once. I could see a Mockingbird getting used to humans. I was surprised in FL when I saw a Great Blue Heron standing 5 ft from a fisherman on a crowded beach, with many people strolling by. The heron was getting bait handouts! I wondered if I should write about this “birding fail” but I figured I wasn’t alone. Besides, I am the “Accidental” Birder. Glad you enjoyed it. How funny! And me too – I am especially susceptible to small stumps sticking out of water. There’s a cluster of them on a drive I make weekly, and I *know* they’re just stumps, but every time I see them I think “What waterbirds are those?” anyway. Love the punch line! Statue, indeed! Sometimes I feel like my birding is one big punch line. Heh.